"You can't be sad when you're holding a smoothie"
My obsession with smoothies - I recently discovered that I have a gluten and dairy intolerance. I have suffered with dermatitis all my life and there has been tears, frustrations, inflammation, pain and itching for years! And it was all by chance that I made my little discovery. I decided to cut carbs and dairy out of my diet because I wanted to lose weight; pretty much everything I ate was wheat, carbs, and dairy. I went and bought myself a cheap juicer, in case I got bored after 2 weeks and It was just put at the back of the cupboard with all the other unloved kitchen appliances. But my juicer has changed my life; by removing an affliction that was a big part of every day and helping me with my weight loss at the same time. I wanted to share 5 of my most delightful breakfast smoothies that have helped me… okay. Ready, set, go! Okay I know this might sound a little odd, banana and coffee. But trust me, this is definitely far from wrong, it's absolutely delicious. And anyone that loves coffee will adore it, because it gives you that early morning boost, and takes no time at all to make. First add the banana into the blender. I personally use frozen bananas because I really enjoy drinking my smoothies cold. Now add the coffee, almond milk and lastly your honey and press that button. Watch it all come together and once you're happy it's all mixed and smooth, pour this delightful morning booster into your favourite glass or mug and drink. Tastes so good! This smoothie has been my go-to smoothie since I began my weight loss journey. 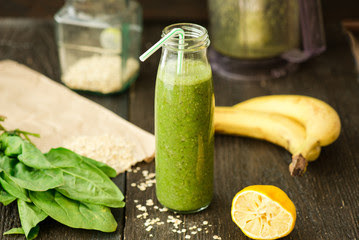 Some days I will drink this smoothie for my lunch because it's full of goodness; spinach has quickly become my main ingredient in everything I eat. This smoothie is just perfect, and since I have been drinking it, it has even improved my skin and hair. How do I know this? I haven't needed to do my hair treatments as frequently to keep it in a good condition. All the ingredients really complement each other in taste: it's a winner! I pre-freeze and keep my bananas chopped up in a freezer bag. I add in one frozen banana, chop the carrots and they go in too. I then add in the spinach and kale; all these ingredients are fantastic to make you feel and look better. It doesn't take long to see the benefits. It is also a really good source of Iron, Vitamin A and Vitamin C. Blend, blend, blend, and taste it! The banana and carrot both give a really nice sweet flavour, so don't be afraid..... it won't taste bad! Raspberries: these little red rubies are really low in sugar, so they are great to add in to smoothies, and the tanginess of them really gives a refreshing taste. 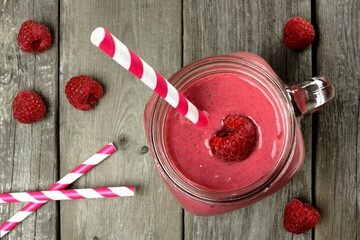 I'm really enjoying my raspberry smoothies - especially now that summer has arrived. You can use fresh raspberries, but personally I buy a bag of frozen ones and add a few strawberries in too. The concoction of both berries works so well and the deep red makes any glass look beautiful. As they say "you eat with your eyes" and this really does taste as good as it looks. This smoothie is very easy to make, no chopping involved, it all goes straight into the juicer. Firstly I put in all the berries, then measure my water, which is generally half a cup, and add that in with a spoon of honey for the lovely sweetness. And drink! It really is a great start to my morning. My nutty smoothie is a real treat. I am not such a peanut butter fan, which is clearly going to sound odd, as i'm writing a recipe that centres around it! But in this smoothie I really love it. 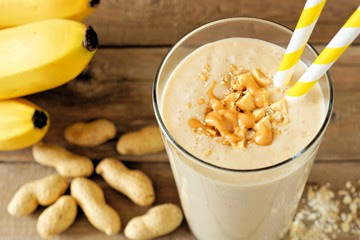 Without the peanut butter the taste doesn't quite work, and once combined, it really holds all of the other ingredients together. 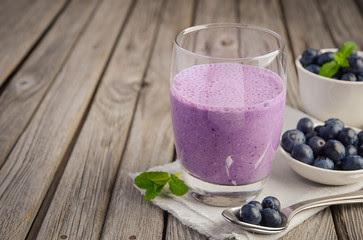 This is a really wholesome smoothie too. The oats in it leave you feeling really sated, making it a really good drink for winter mornings. It reminds me of christmas markets, not to mention the smell is gorgeous! Go on, be daring and give it a go! Firstly, as you may have gathered, I put my frozen banana in first every time. I then cut half an orange, peel it, and remove any pips inside. Add the orange to the juicer; the tanginess and the sweetness of the orange in the smoothie makes it taste really good. I then add in my oats. You have to be careful though if you are trying to be gluten free and check the back of the ingredients. Sometimes oats can be contaminated with wheat, barley and rye. I always get mine from the ''Free from" aisle just to be sure. I then add in my cup of almond milk, or if you prefer, you can use a cup of water - both taste equally good. Lastly a tablespoon of peanut butter and blitz it! This smoothie is also fantastic just as a dessert by making it with less fluid. It's honestly really tasty, all you peanut butter lovers will adore it! My final smoothie.....and I'm so obsessed with this smoothie! It's got all my favourite ingredients and they all work really well together. The subtle hint of spice from the cinnamon is there on every sip you drink, with the sweetness of the dates in the body of the drink. Dates are high in fibre, so drinking this first thing in the morning is really beneficial for your body. The cinnamon helps balance your body's blood sugar levels too. I think anyone that drinks this smoothie will fall in love with it. Put in your frozen banana, berries and dates - make sure you have de-stoned your dates - you don't want to break your juicer! Now add in the almond milk and the cinnamon. 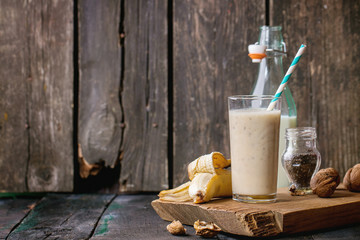 Mix it all together, and once it's smooth, pour this very tasty smoothie into your glass. All the ingredients really work nicely together; I know they're a strange mix..... but sometimes the oddest things go together. I hope you can try all my favourite smoothies and I hope you enjoy them as much as I do. If you're in the South of France profiter de votre boisson. But if you're in a wet England, wishing that you were, enjoy your drink!